Witnessing the lunar eclipse was magical. Planning and shooting the same was a lot of fun. Out here, in the north east of US, the lunar eclipse was not total, so missed out on the blood moon, but it was still a scintillating experience. As the moon was getting into total eclipse, it set over the horizon. But at the same time it created for some interesting photographing options. This involved a lot more planning than it meets the eye (and a bit of luck, as there were too many variables from the weather, location, time zone, the quality of the air etc. Will share more details on the planning and tools in a separate article, for my geek friends out there shortly. Additionally, this is something new I had tried. Had always wanted to shoot a scene around sunset and into the night and highlight the same in a single frame as time-slice [A time slice is depicting a time range in a single frame]. When I learnt about the lunar eclipse, this past week, thought it might be a good candidate for time slice. 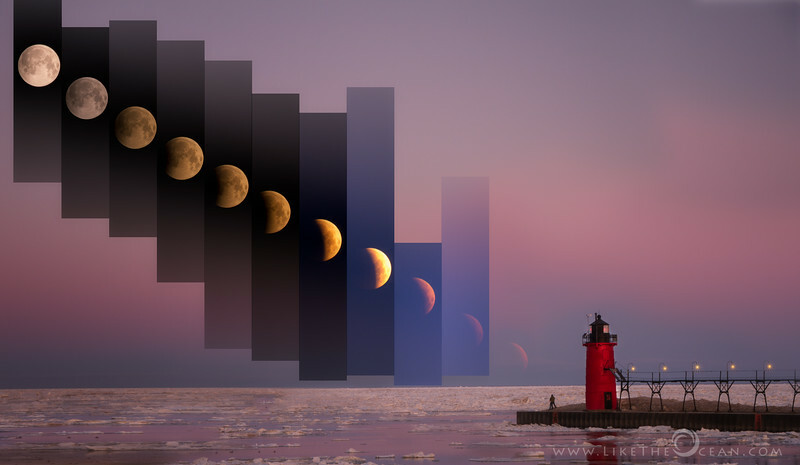 This shot is a mix of landscape and time slice – in an attempt to highlight the lunar eclipse in the context of the surrounding landscape. This was a panorama made out of a composite. Though it does not look like a wide view, that is what helped capture the moon and the lighthouse in context (all 12 images [10 for the moon and 2 for the lighthouse] used to create the same, were shot at the extreme end of my long zoom lens). The long zoom helped actuate the size of the moon to some extent due to the much debated perspective compression effect.